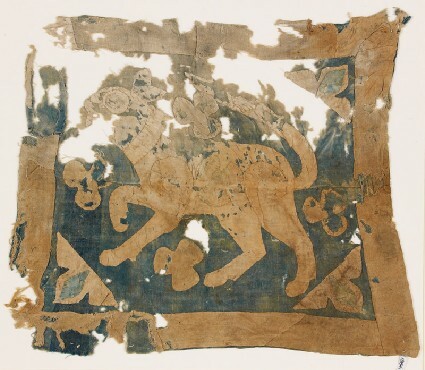 A large blue field with a white applique lion at the centre surrounded by four white trefoils. The corners of the field hold trefoils, and there is a white border all around. The textile was possibly part of a standard or other kind of display textile. The uncalibrated radiocarbon date is 920 AD +/- 36, but the calibrated result of 980 to 1160 suggests a later date, well into the Fatimid era. On stylistic grounds this is likely.